Don't miss an explosive night of action at the Hell in a Cell PPV! The Usos challenge The New Day for the tag team titles inside the steel HIAC confines, and so too does Shane McMahon as he takes on the menacing Kevin Owens. Hit F5 or refresh for the latest updates! Our best wishes to the site's own Killa Kev as he was in a car accident earlier today. Thankfully he's okay save for a busted arm but we all wish him a rapid recovery. They announced on the pre-show that Tye Dillinger would be added to the US Title Match and it's now a Triple Threat with AJ Styles and Baron Corbin. This match is sponsored by Mountain Dew Kickstart. I wonder how much Mt. Dew is paying referee Charles Robinson, for instance. The match built well and had a better than average finish. Gable pinned Ryder to win the match after a combination power bomb/top rope clothesline. Xavier and Big E were the New Day team and the match begun with all four men pulling out plunder, which included Big E getting a chain. E went for his spear to the floor early, but Jey Uso moved and caused him to dive into the cage. Jimmy then hit a huge plancha onto Xavier and when he got back onto the apron E hit his spear to the floor. Xavier broke multiple trombones on Jimmy's body and then upgraded his musical weapon to a cowbell and a giang gong. New Day went for their finish, but Jey threw a chair, Sabu-style, at Xavier's head. With Xavier selling, the former champs took turns breaking kendo sticks on Big E. While E sold the Uso's went outside the ring and gave Xavier the running hip attack against the cage. Jey and Big E fought on the ring apron, which is the hardest part of the ring and E gave Jey a uranage as Xavier ran up and used a Back Stabber, which seemed to hurt Xavier just as much. Big E and Xavier battled back and somehow managed to trap Jey Uso in the corner of the cage and trapped in with kendo sticks. It didn't last long, but it was a cool visual. Jimmy hoisted E up for a Doomsday Device on the floor, but Jey instead did a Suicide Dive and E crashed into the wall of the cage. They threw Big E back in the ring and both brothers hit a Superfly Splash, but E kicked out! Jimmy and Jey pulled out handcuffs next, cuffed Xavier and trapped him, hanging from the cuffs, from the ring post. Then we got stereo kendo sticks as the brothers beat on Xavier, while Kofi had to watch from 5 feet away but on the outside of the cage. They got set to do something similar to Big E, but E raged up! First he heaved one of the Uso's out of the ring and then carried the other one and slammed him repeatedly into the cage walls. Back in the ring Jimmy got hit with a Big Ending, but kicked out. It was time for a Superkick Party as Jimmy and Jey hit about 7 Superkicks on E. Then they hit a simultaneous Superfly Splash that would have been the finish, but Xavier flew in to break it up. Xavier, still handcuffed, went crazy and double sledged both men, until Jimmy caught his hands and held him while Jey hit him again and again with a kendo stick. Finally they set a chair over Xavier's body, came off with the simultaneous Superfly Splashes and The Uso's, yes The Uso's, are now 5-time tag team champions. AJ Styles understands why Tye Dillinger is being added to the title match even if he doesn't like it. He's going to make the best of a bad opportunity and win tonight. 10 seconds in it was already the longest televised match these two ever had. Orton went for an RKO, but Rusev shoved him off. Rusev cut off Orton and we settled down with Rusev getting the heat. First he knocked Orton off the ring apron, sending him crashing into the dasher boards and then he gave Orton the Fallaway Slam into the boards again. Orton got a brief comeback, hitting a side suplex onto the barricade, but he got cut off again. Orton fired up again and went for his power slam, but Rusev held onto the ropes and Orton crashed to the mat. However he was able to retain momentum, eventually hitting the power slam, but he couldn't hit either the Draping DDT or the RKO. Rusev hit his high kick that has never won a match and got frustrated when it didn't win the match. Orton rolled to the outside, so Rusev ran halfway around the ring in order to superkick Orton. Back in the ring Orton dodged, ducked, dipped, dived and dodged out of the way of a Rusev splash and hit the Draping DDT. The finish saw Orton pound on the mat, but Rusev quickly mounted him and went for the Accolade, but Orton slipped out and hit an RKO for the win. This is faint praise, but this is easily Orton's best ppv match in two years. Baron seemed perfectly fine sitting back and letting the other two fight each other, but it didn't sit well with AJ and Tye, as they began the match by double teaming Corbin. Baron was only out momentarily as he was content with throwing AJ all over the ring. AJ tried to kill himself in an effort to drag a good match out of Corbin. Baron flung AJ with a beal across the ring and then throwing him into Tye and ribs-first into the post. Shockingly this match wasn't as good when it was time for AJ to sell for lengthy periods of time. Baron slapped on a rest hold. It always makes me laugh when you see a rest hold in a 3-way or 4-way since you can usually avoid having rest holds by laying out the odd man to give them a breather. AJ got back in, which made the match more exciting. It got even better when it was Baron's time to rest, so AJ and Tye went all out. Tye went for the Tye Breaker, but AJ got out of it. AJ went for a Styles Clash, but Tye kicked his way out of that. AJ did get on the Calf Crusher and Tye may have tapped, but Baron dragged Tye out of the ring. AJ was so upset he did a springboard dive onto Baron. Corbin was so mad he shoved AJ into the ring post. AJ used the Springboard 450 on Baron, but Tye broke it up. Dillinger was selling his knee, but went for the Tye Breaker. AJ got out of it and hit the Phenomenal Forearm, Corbin ran in and stole the pin, throwing AJ out of the ring, pinning Dillinger and winning the title. We had a fast start as both ladies teased their submissions early on, but Natalya took over by working over the knee of Charlotte. These two women have wrestled each other for every recognized Women's Title in the WWE Universe in the last 4 years, which Charlotte winning more often than not. Charlotte managed to power out of a Sharpshooter attempt and used her one good leg to kick at Nattie. Charlotte seemed to forget which was the bad knee at one point, but she remembered before it became too obvious. Charlotte hobbled to the top rope for a Moonsault, but Nattie power bombed her off the ropes. Charlotte used more kicks, which seems like a bad idea for someone with a bad knee. Anyway she ended up outside the ring and Nattie went for a baseball slide and this was one of those good news/bad news situations for Charlotte. The good news was she avoided the baseball slide by hobbling to the right. The bad news is Nattie then shoved her knee-first into the ring steps. Natalya got her back in and locked in the Sharpshooter, but Charlotte, with a bad knee, used her leg strength to seemlessly break it and send Natalya into the turnbuckles. After teasing a normal moonsault the entire match, she did one to the outside of the ring instead, mostly missing her target. Natalya finally got pissed off and laid waste to Charlotte's knee with a steel chair, getting herself disqualified in the process. Nattie stood tall over her foe, still champ, even though she takes home the loser's share of the purse tonight. After a lengthy absence we finally got a new Fashion Files segment. They said they finally solved the case of 2B, which was when they got attacked mysteriously like 3 months ago. They said the guilty party is behind bars. In walked two large delivery men. They gave Breeze a tube, which Breeze used as proof that they may have sent an innocent man to jail. Fandango said the case was still open. The delivery was a poster of The Ascension with writing saying "They want 2B their friends". Breezango called Konnor and Viktor ugly...and oh my god! Those delivery guys were The Ascension! They walked off mad. However a briefcase was left at the door and they did the Pulp Fiction joke with the bright light coming from the case. This led to the announcement that Pulp Fashion was debuting this Tuesday. The match started slow and threatened to taper off from there. Tom Phillips all but said that Jinder's strategy was to have a slow, boring match. Nakamura walked around the ring at a faster pace than Mahal was going. I remember when JBL suddenly got this random push outta nowhere and you can sit and argue how effective it was, but the key was Bradshaw stepped up his game in the ring and on the mic. He went from a "WTF Champion" to pretty close to a legit main event champion. Jinder, on the other hand, has had one boring match after another and has not cut anything resembling a good promo. This rant, by the way, is more exciting than recapping Jinder on offense. However if that is important to you, Jinder locked on a chinlock and then another chinlock and a third chinlock. Nakamura got tired of resting and woke the crowd up momentarily. He even took out the Singh's before they had a chance to interfere. Nakamura had Jinder laid out on the ring apron and went for a knee drop, but the champ moved out of the way and Nakamura crashed onto the ground. Jinder went for The Khalas (Hey I finally spelled it right), but Nakamura got away from it. The Singh's interfered again, but Nakamura beat them both up multiple times until Charles Robinson threw them out of the ringside area. Nakamura finally hit the Kinshasa but Mahal grabbed the ropes with his hand. Nakamura went for a second Kinshasa, but Jinder rolled out of the ring and tried to run away. Nakamura got him back in the ring, but Jinder went for the Khalas, but Nakamura got out of it and went for the Kinshasa. Jinder side-stepped it and the challenger crashed knee-first into the turnbuckle. The challenger will forever remain the challenger, as Jinder hit The Khalas for the pin and retained the title. After pinning both John Cena and Randy Orton to get title shots, who is Nakamura going to beat next so he can lose to Jinder again? Kevin Owens kicked Kayla away from the interview area and said people should be talking about how he is the most lethal and unforgiving wrestler. No one thought about his family when Shane screwed him out of the US Title. Shane is a bad person and tonight Owens will teach him a lesson even if he has to rip every ounce of flesh off his face to do it. Remember when it took Roode over four minutes to walk to the ring on NXT tv shows at Full Sail? Well he walks a whole lot quicker on the main roster, as he got there in less than 60 seconds. After spending weeks mocking different legend's entrances Dolph came out and cut his entrance music and walked to the ring with a single spotlight. This was the definition of a bathroom break match. The fans were kinda into it because they like Roode's entrance, but it was obvious that this match only existed so the crowd could "come down" from the prior match. Of course when the prior match has Jinder Mahal there is no need to come down any more. The crowd became so down they died. Roode's comeback was met with total silence. Seriously I imagine people in the upper deck could hear the commentary. A few people tried getting a "Let's Go Ziggler" chant going, but that didn't last. Roode side-stepped a Superkick and hit a Spinebuster. Dolph used a roll up with a handful of tights, but Roode rolled through and pinned Dolph with a handful of tights. Roode stood up in victory, however Dolph laid him out with a ZigZag. This feud must continue. Shane attacked Owens outside the cage to start the match and the brawl was on. Shane did a cartwheel kick at one point, so Owens ran into the Cell, followed by his foe. As soon as Shane got on the apron Owens knocked him off the apron and into the wall of the Cell. Owens began grinding Shane's face into the cage right in front of Shane's kids, who were laughing. As Owens choked Shane with his boot he yelled at him to do it for his kids. What is the best way to keep us from seeing Shane's awful punches? By having Owens on offense 85% of the time. Owens yelled at Shane's kids between kicks that he should be their role model. Owens went for the Swanton off the top rope, but Shane got his knees up, which really is a bad idea. Shane potato'd Kevin with His Punches and then missed like 14 of them so badly that it was hard to believe Shane meant to hit them. Shane hit the float over DDT, which led to a "You still got it" chant from the same people chanting for Dolph earlier. Shane went up top and missed the best Shooting Star Press of his career. KO hit a Frog Splash and went for a Pop Up Power Bomb, but Shane turned it into a sloppy triangle choke. How sloppy? At no point was any part of his body around Owens' throat to choke him out. KO got tired of having his head pulled into Shane's crotch and slammed him onto the ring steps outside. Kevin set up a table against the cage, leaned Shane against it and went for a Cannonball off the apron, but Shane moved out of the way and the former Universal Champion crashed and burned through a table. Looking under the ring Shane found a trash can and the fans began buzzing. Sure enough Shane did his Van Terminator dropkick, but Owens got his foot on the ropes. That led to a discussion over whether or not it would be allowed. Shane then demanded the door be unlocked, but when the referee wouldn't, Shane went under the ring for bolt cutters. In one of those "only on live tv" moments Shane could not break the chain at first, but finally did. Owens got the best of it, ramming Shane crotch-first into the ring post before they made their way over the the broadcast tables. Owens used a headbutt to lay Shane down on the table. At first he teased splashing Shane off the dasher boards, but he just looked up and decided to climb the cage instead. Owens got up there and looked down and froze, deciding to not leap. He would get to the edge and then change his mind. Shane got up and climbed to the top of the Cell after Owens. The biggest reaction so far was them doing the Hockey Fight spot. Shane gave Owens both a Side Russian Leg Sweep and a body slam on top of the Cell, which was enough to determine that this was awesome to the crowd. Owens took over and gave a Cannonball on top of the Cell. He went for a Power Bomb, but Shane backdropped out of it. Owens finally hit a Pop Up Power Bomb on top of the Cell, but no cover. Plus the referee is 20 feet below them. Owens went to throw Shane off the Cell, but Shane put the breaks on. They continued to play near the edge when Owens decided he had enough and started crawling down. The fans booed as Shane joined him. They ended up on the crossbar halfway up when Owens took the Vince McMahon cage bump where Shane smashed his head off the cage and Owens fell through the announce table. The medics came over to check on Owens and Shane told them to leave so he could do more offense. Shane cleared the American announce table and set Owens on it with a headbutt. Shane then climbed to the top for the Elbow Drop. I think we all see where this is going. Shane dove off the top...but someone pulled Owens off the table! Shane crashed through the announce table...and it's Sami Zayn? Sami Zayn saved his bitter rival! The EMT's came down, but Sami shoved them away and dragged Owens on top of Shane for the pin! Zayn had snuck down with all the medics and was wearing a black hoodie, just blending in and no one noticed him there until he saved KO. 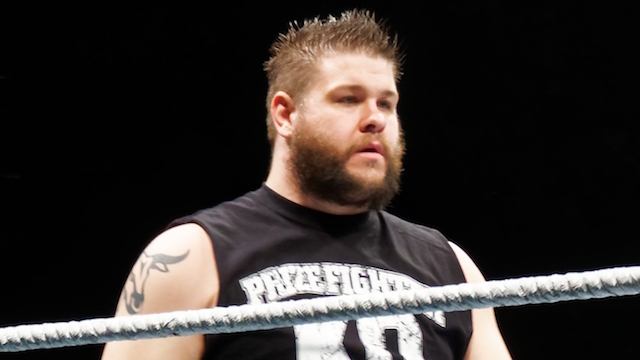 Thanks to Sami Zayn, Kevin Owens has pinned Shane McMahon. That does it from Hell in a Cell. Thanks for reading and I'll see you in 2 weeks for TLC.